As students and teachers continue to have increased access to digital tools and resources, there is a shift in the traditional instructional practices that have been used for teaching and learning. Textbooks are no longer the primary source of information, and students can fact check their teachers with the devices in their pockets. Also, content has to be more than just digitized textbooks and documents. Students must interact with digital content and produce new ways to show what they have learned. 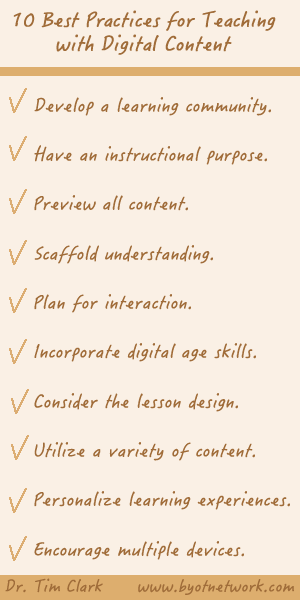 Here is my list of ten strategies for teaching with digital content, but please share your original ideas. 1. Develop a learning community. I know that I talk about this process throughout my BYOT Network blog, but developing a community is essential to any digital age learning environment. Students and teachers want to feel a sense of belonging within schools and classrooms. Teachers have to maintain high expectations for student behavior and performance, and students will strive to live up to these expectations. By modeling and supporting digital citizenship, teachers can help students internalize the responsible use of technology tools. As they work collaboratively to solve authentic problems and share their original projects with others, students begin to realize a purpose that sustains a learning community. 2. Have an instructional purpose. With all of the demands of being a classroom teacher, it is understandable that teachers sometimes need to engage student learning with digital content. However, it is better practice to have an instructional purpose for the video being shown to students within a classroom. Teachers should consider why they are utilizing particular digital content within their planning and use it intentionally to make a difference for each learner. As with all forms of media being shared with students, teachers should carefully preview all digital content to be shared with students. Teachers should consider the particular needs and expectations of their learning communities – the age of the students; the learning standards; the values of the parents – before utilizing digital content for instructional purposes. Within the design of a lesson that incorporates digital content, teachers have to scaffold understanding. How are those resources being used to engage student learning? Video should be used purposefully and with short clips (less than a few minutes) to stimulate questions and critical thinking. Directions need to be clear, yet minimal, so that students are able to use their thinking to solve problems. Finally, there should be a variety of types of formative and summative assessments so that students have multiple risk-free opportunities to demonstrate learning and ensure success. After students view video or another form of digital content, they should be encouraged to interact and collaborate with each other to construct new meanings from that information. Students can participate in a backchannel discussion using technology tools to pose new questions and ideas about their learning. Teachers can use digital content to help students compare and contrast new concepts in collaborative groups, and students can create authentic products to demonstrate their learning. There is a need for students to become producers of new digital content rather than just being consumers of information. 6. Incorporate digital age skills. Teachers can support digital age learning by incorporating the 4 Cs – Communication, Collaboration, Critical Thinking, and Creativity – within their classrooms. By collaborating with others through online discussions and assignments, students practice and learn the appropriate netiquette for communication in the digital age. By using critical thinking to build a personalized playlist of digital content, they can learn or review information. Finally, they can create original projects to show what they know and upload them to share with others as new learning objects. 7. Consider the lesson design. As teachers plan for instruction with digital content, they are able to consider effective lesson design. Beginning with an essential question, teachers are able to prompt critical thinking about the standard or concept. They can show a video segment that encourages student learning and then link to an interactive assignment that supports student creativity as they work collaboratively to solve authentic, real-world problems. Finally, the teacher can utilize another form of digital content along with questioning techniques (involving student response) to provide opportunities for formative assessment. There are so many choices with digital content that enable teachers to be lesson designers in a dynamic learning environment. 8. Utilize a variety of content. One of the benefits of digital age learning is that students can access a variety of content types with technology tools. Audio, images, video, interactive websites, applications, and text can all be integrated to provide students with multiple opportunities to choose how they will learn. However, one reality is that students will eventually have to learn using different modalities, and teachers should carefully plan how to develop students’ skills to make meaning from diverse types of content. Focusing on the needs of the students and their learning goals can help teachers make wise choices about how and when to use particular digital content. Students have unique talents, abilities, and differences that can pose challenges to the one-size fits all classroom. By personalizing learning experiences, teachers can help students identify the pathways that meet their individual learning needs and interests. A teacher could begin helping students identify their strengths through a learning style inventory or interest checklist, but digital content can also be used meaningfully to differentiate learning experiences. This personalized approach provides voice to students as they show what they know in ways they perceive as relevant. With the tools in their pockets and backpacks, as well as the ones provided within their schools, students have access to multiple devices, and teachers should encourage their use. Students can use a handheld device to quickly communicate or access content, but there may be times when they need to use resources from the school, such as desktops, interactive whiteboards, or 3D printers to create other products. Knowing how to choose the right device, at the right time, to interact with digital content promotes the critical thinking that students need for academic success in the digital age. 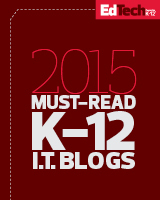 This entry was posted on November 2, 2014, 9:38 pm and is filed under BYOT Strategies. You can follow any responses to this entry through RSS 2.0. You can leave a response, or trackback from your own site. I found myself reflecting on ways to plan for interaction, one of the 10 Best Practices mentioned in the article. I often have students “turn and talk” or work collaboratively in groups, but haven’t incorporated technology in those scenarios. It would be interesting and fun to have the class create a Venn Diagram, splitting the class into groups, each researching their given topic on their Ipads, computers, or other tech devices. Thanks for your suggestion, Karen! I would be interested in using this article in a training course for my new faculty. Would it be possible to utilize it with the appropriate citation and credits? It’s terrific!